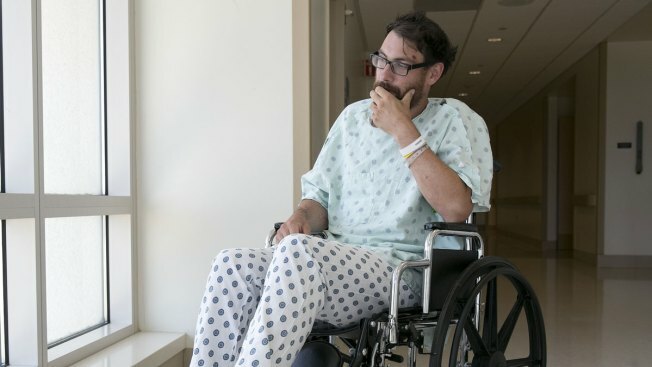 Mathias Steinhuber, of Innsbruck, Austria, who survived being struck by a lighting bolt, pauses while discussing the near-fatal event, Thursday, Aug. 24, 2017, in Sacramento, Calif. Steinhuber had been hiking the Pacific Crest Trail near Donner Summit Tuesday when he stopped to take a photo and was hit by the lighting. He was taken by helicopter to the the Tahoe Forest Hospital in Truckee, before being flown to the University of California, Davis Hospital Burn Center where he is listed in fair condition. There was no rain, no rumbling, no sign of danger before the blinding flash and deafening bang of a lightning bolt threw Mathias Steinhuber to the ground, tore off his clothes and burned a gaping hole in his shoe. The 31-year-old Austrian teacher, an avid hiker, had just reached the 9,000-foot summit of a Northern California mountain range ahead of his companions when he raised his arms for a picture and was struck in the back of the head. The electricity shot through his body and exited through his foot, and he was too stunned to know what had happened. "It was like in a dream," Steinhuber told The Associated Press Thursday. "I woke up. I had blood everywhere. My clothes were ripped apart. At some distance I heard my girlfriend scream my name. My first conclusion was that I probably fell down the mountain." He crawled to a ledge and saw his girlfriend and their friend below and wondered, if he'd fallen off a cliff, why was he still above them? That's when he heard the girlfriend, Kathrin Klausner, scream that he was struck by lightning. Steinhuber had cuts and bruises from his fall and a number of burns he described as mostly superficial. The hair on one of his arms was singed when he spoke to the AP at the University of California, Davis Hospital Burn Center in Sacramento. He's struggling to hear through his left ear. He and Klausner, who are from Innsbruck, Austria, were hiking a stretch of the long Pacific Crest Trail as they neared the end of a nearly four-week trip to the United States. He hurried ahead, looking to get an extra workout as he climbed to the top of Tinker Knob, a bare peak near Lake Tahoe with sweeping views of the surrounding Sierra Nevada peaks and forests below. He doesn't remember being struck, only the aftermath, and drifting in and out of consciousness until help arrived. "He was taking a picture and the next thing I know, I see this white flash, like an explosion," the couple's friend, Cara Elvidge, told The Associated Press in a phone interview from Fairfield, California. Elvidge and Klausner took shelter and called for help, not knowing if he'd survived. Authorities told the women not to climb up to help, lest they put themselves in danger. A helicopter landed on Tinker Knob, elevation 8,949 feet, and dropped off a paramedic who tended to Steinhuber. He was taken to a hospital in nearby Truckee then flown to the burn center in Sacramento, where he was listed in fair condition late Thursday. Meanwhile, Elvidge and Klausner had to hike out for six long hours without knowing whether Steinhuber would survive or endure debilitating injuries, Klausner said. "I cannot tell you how thankful I am for just being here, for him to be alive," Klausner said. "Seeing him like this is a miracle, and I'm thankful every day for this." The couple was supposed to return to Innsbruck on Thursday, but they spent the day in the hospital. They're eager to go home but unsure when Steinhuber will be well enough for the lengthy plane ride, he said. "Somebody told me the odds are higher winning the lottery than getting struck by lightning," Steinhuber said. "I would've rather won the lottery."